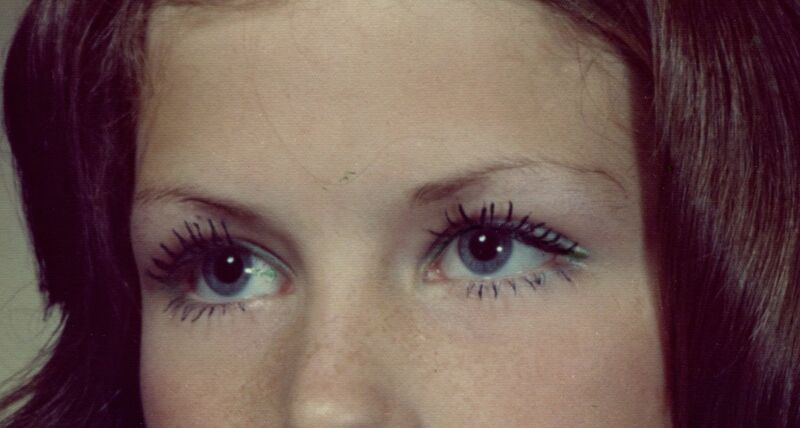 When I was an adolescent, I made some very unfortunate makeup choices. One of my first signature looks was an alarmingly bright turquoise cream eyeshadow that I slathered on both eyelids. I thought it set off my blue eyes. With that metallic green-blue glowing from my lash line to my brow bone, I now understand that no one could have noticed my grey-blue irises. By high school, I had exchanged the eyeshadow for mascara. When I sat at our dinner table facing the bay window, the bright chandelier turned the darkened view into a mirror. I was a great admirer of my reflection. Most memoirs and many novels have at their root an author who is coming to terms with her dysfunctional upbringing. Underlying their narrative is a turbulent upbringing that haunted them into adulthood with substance abuse issues and shattered relationships. When I write about my father, I feel as if I am beachcombing. I walk slowly along the sandy beach, crossing miles of uniform sand granules, until I stumble across a fragment. If I walked more quickly, I’d miss it – something shimmering there in its beauty. But having seen it, I pick it up, hold it in my palm, turn it over. But he didn’t. Deadpan, he would wryly invoke my name spelled backwards, “How is Ysteb tonight?” Hearing that didn’t feel like a rebuke or even a criticism. I took it as, “Come back to the table, please. You’re not the only one in the room.” It felt like an act of love, even if there was a tease thrown in for good measure. I got the message. I remember few rules from my youth. I wasn’t harangued to make my bed, come home at a certain time, do my homework, achieve better grades or get off the phone. I wasn’t told when I could start shaving my legs, or wearing makeup or start dating. I did want approval, my father’s approval in particular, and I knew what he admired without him ever saying a word. I was more interested in the brass ring of admiration than avoiding the sting of criticism or the pain of punishment. Recently, I learned that one of my acquaintances on Facebook is tired of my posting about my father. She thinks it’s time to get over the grief and move on. She has missed the point entirely. I’m not grieving, I’m appreciating. My experience of my father was subtle. He was just there, a quiet, predictable and strong presence even when he just referred to my twin in the mirror. Sitting at my parents’ table, I didn’t appreciate what I had. It’s taken me four decades to get to the point I can see the beauty in his love and influence. And it remains with me. Last weekend I attended a retreat where the facilitator shared this poem. The utter reliability of my Dad led me to take him for granted. Remembering the subtle ways he expressed his love for me, my mother and my brothers is a gift that keeps on giving. Oh, Lissie, thanks! I admit the comment set me back on my heels a bit. But that acquaintance hasn’t experienced loss. I find joy and meaning in rewinding memories like this one today, of my outrageous mascara addiction!